ANAHEIM, CA, USA: cutting-edge audio technologies developer The Best Computer Music And Acoustic Technology Inc is proud to announce availability of Bamboo Dreams— its latest hybrid virtual instrument for Mac (AU 32-/64-bit, VST 32-/64-bit) and Windows (VST 32-/64-bit), featuring deep sampling Chinese Woodwinds. Begin at Feb 5th, 2019. Bamboo Dreams is a collection of Chinese woodwinds instruments, including Long Dizi, Short Dizi, Bawu and Xiao. Long Dizi is a Chinese transverse flute, or Chinese Bamboo Flute. dizi is a major Chinese musical instrument, and is widely used in many genres of Chinese folk music, as well as Chinese opera, and the modern Chinese orchestra. Traditionally, the dizi has also been popular among the Chinese common people, and it is simple to make and easy to carry. Xiao is a Chinese vertical end-blown flute. It is generally made of bamboo.Xiao is a very ancient Chinese instrument usually thought to have developed from a simple end-blown flute used by the Qiang people of Southwest China in ancient period. In the oral traditions of the Xiao, its sound is said to resemble the sweetness of the Phoenix’s call, the King of Birds in Chinese belief. Therefore, it can be said that Xiao is the king of all Chinese flutes. Bawu is a Chinese wind instrument.Although shaped like a flute, it is actually a free reed instrument, with a single metal reed. It is played in a transverse (horizontal) manner. It has a pure, clarinet-like timbre and its playing technique incorporates the use of much ornamentation, particularly bending tones. 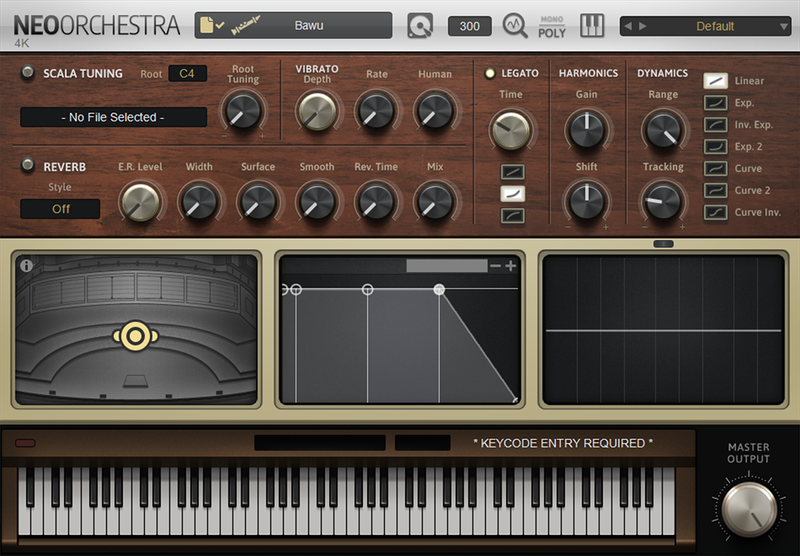 This deeply sampled 5GB Library applies the latest hybrid modeling technology; it can also represent glissando, vibrato, bending and harmonic more vivid than other sampled instrument. The playability from modeling technology enables it to change timbre real time during playing, and this gives the sound more varieties and expressive than sampled instrument. What is more, we also sampled the portamento samples that will bring a more vivid sound. Bamboo Dreams is designed for simplicity; we make all technique possible finish in one track. With our unique performance key switch system. Which you can switch technique fluently and easily. Modeling technology also provides support for real-time interaction and change on sound. For example, you can smooth change from a plain sound to a full vibrato sound. That is difficult to achieve by sampling technology. And this adds more realistic to final sound.